Sinkhole Insurance Claims – Makris Law, P.A. There are many types of sinkholes. However, in essence there are two types – the type of sinkhole you see on tv and the type of sinkhole that you don’t see on tv. The type of sinkhole that you see on tv is catastrophic. A large hole beneath the ground surface has opened up and swallowed a house or a car. However, the more common type of sinkhole is not a large hole that opens under your home or business. Scientifically, it is the act of rainwater moving downward causing soils to weaken and ravel downward into holes or voids in the underlying limestone. 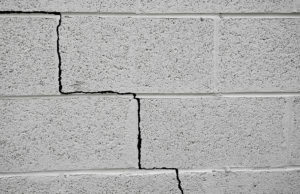 Simply put, the ground beneath your home or business is slowly weakening causing a lack of support to the foundation and structure of your home or business resulting in cracks or other damages. Cracks are the most common indicator that sinkhole activity may be present. Cracks typically appear in driveways, walkways, floors, exterior and interior walls, and ceilings. The cracks could form a stair-step pattern or remain vertical, horizontal or diagonal. Other indicators of sinkhole activity are difficultly opening and closing doors and windows, depressions or holes opening up in the yard, leaning fences or mailboxes, and separations that were not once there between the walls, floors, ceiling, moldings, or cabinetry in your home or business. It is likely that you have noticed cracks develop over time and other commonly associated sinkhole indicators and did not realize that such minor damages may be a sign of something much more. As such, it is important to remember when you first noticed these damages, and how they progressed over time. Pictures are surely helpful. Especially in the Tampa Bay area, sinkhole claims are very common. Perhaps you have already gone through the sinkhole claims process, found out that you do have a sinkhole under your home or business, and had a company perform the sinkhole repairs as recommended by a licensed professional engineer. However, now, your home or business is starting to experience the cracking and other damage again that once occurred prior to the repairs. In such instants, the sinkhole may not have been repaired. This is called a failed repair sinkhole claim. Here, you may be entitled to have your home repaired again because it was not fixed right the first time. Makris Law, P.A. is a Tampa Bay insurance claim law firm specializing in homeowners insurance claims and commercial property insurance claims, including sinkhole insurance claims and failed repair sinkhole insurance claims. If you experienced cracking damage to your home or business, please contact us promptly for help. We are very experienced in handling the scientific aspects of sinkhole insurance claims and failed repair sinkhole insurance claims. We will review the investigation performed by the insurance company to determine whether or not an adequate investigation was performed and will retain a licensed professional for a second opinion on whether or not you have a sinkhole. If your insurance company is delaying your sinkhole or failed repair claim, denied your sinkhole or failed repair claim, or underpaid or lowballed your sinkhole or failed repair claim, contact us today.